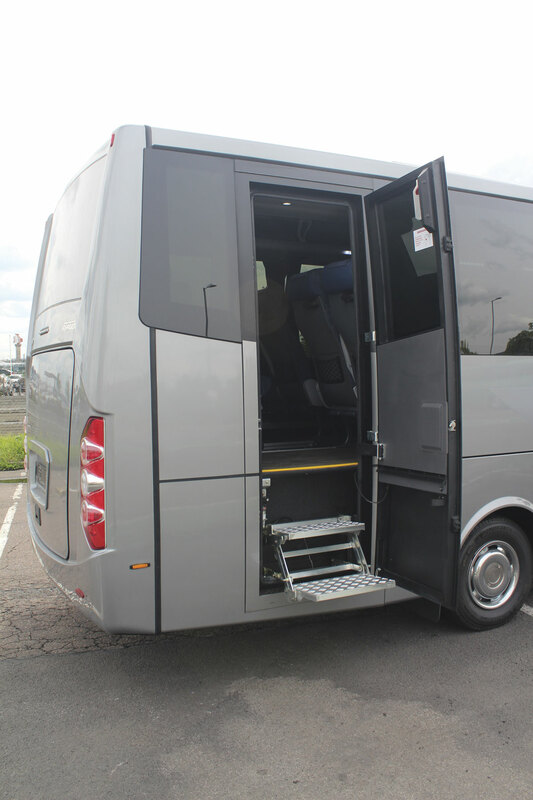 In common with every other supplier in this sector, Moseley in the South is having to face up to the disappearance from the market of the Mercedes-Benz Vario which has not been developed to Euro6. In truth, the Vario chassis has been looking increasingly agricultural in comparison with other modern vehicles, especially its smaller Sprinter stablemate, but in a sector where vehicles work hard to earn a living, it has enjoyed an unrivalled reputation and provided the best characteristics in terms of capacity and support as a base for a 25-33 seat coach. Now it is gone, it isn’t coming back and Mercedes-Benz has no plans for a direct replacement so the market has to find an alternative. 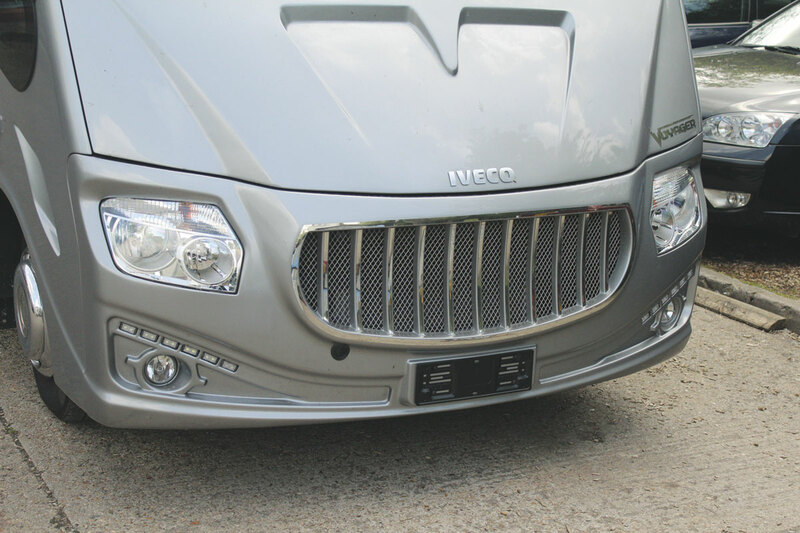 The loss of the Vario is particularly significant for Sitcar because they have used it as the basis for a significant percentage of their production. Sales Director, Rudolph Vallet, told me that 2013 had been much the same as 2012 for the company, with overall sales of around 110 units. In the last 12 months they have built 46 Belugas, of which 27 were for the UK. The final one for the UK has just been delivered to Moseley in the South. The very last Beluga of all is currently nearing completion for the Italian operator SAP of Pietra Ligure near Genova in Liguria, who has specified 29 leather trimmed Vogel recliners and a television among its features. Sitcar did build the Marlin with its pronounced front dome arrangement on the Atego chassis but has not done so for some time. Rudolph said that the Marlin was longer built, and no other body was currently offered on the Atego, ‘but we are thinking about it.’ The other product that Sitcar produced that was close to the capacity of the Beluga was the Joy, based on the former Sprinter 616, but unfortunately this was another chassis that Mercedes-Benz discontinued. For many applications, it appears the 7.2-tonne GVW Iveco Daily 70C17 may provide an answer. 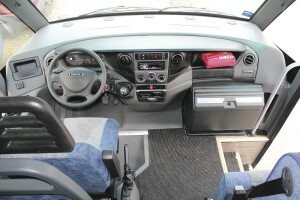 Particularly for the Italian market, Sitcar have found the Daily is a readily accepted vehicle. Starting with the 59.10 and 59.12 and moving on to the 70C range, it has been used as the base not only as the base for military and school minibuses (the latter with capacities of up to 40 with 3+2 seats under Italian regulations), it has also been popular as a tourist coach and as a city bus with a low rear platform. For the Italian market it produces a model called the Italo C70 with 27 coach seats, air conditioning and double glazing. There is also a larger Italo 100 model based on the Iveco CC100 Midi Cargo, but this is only sold in Italy and no thought is being given to selling it in the UK. Shown at Busworld Kortrijk last year was a new Daily based, coachbuilt model, the Voyager, and this could be developed for right hand drive. For Allan Vaulter, MD of Moseley in the South, there is a strong desire to keep faith with the Sitcar company, not only because of the relationship they have, but because his customers like the product and it does a good job for them. However, he is also a realist and if an Iveco based coach does not meet with the approval of his customers, there is no point in him importing it. I was waiting at the Heathrow premises of London Mini Coaches and Windsorian Travel, two subsidiaries of Anderson’s Travel, when the Voyager arrived on a low loader from Italy. Mounted on a Euro5 chassis, it belonged to an Italian dealership which was understandably reluctant to see too many kilometres put on the clock prior to its sale, hence the method of delivery and subsequent collection. My first impression was that the look of the coach is an attractive one, though the wide front grille aperture with vertical ribs does tend to dominate the frontal aspect. Otherwise, the appearance, with a window line sweeping up across the base of the second window, running flat along the next bay and then curving up towards the rear in the final bay, is a pleasing one, coupled with a well balanced rear treatment. 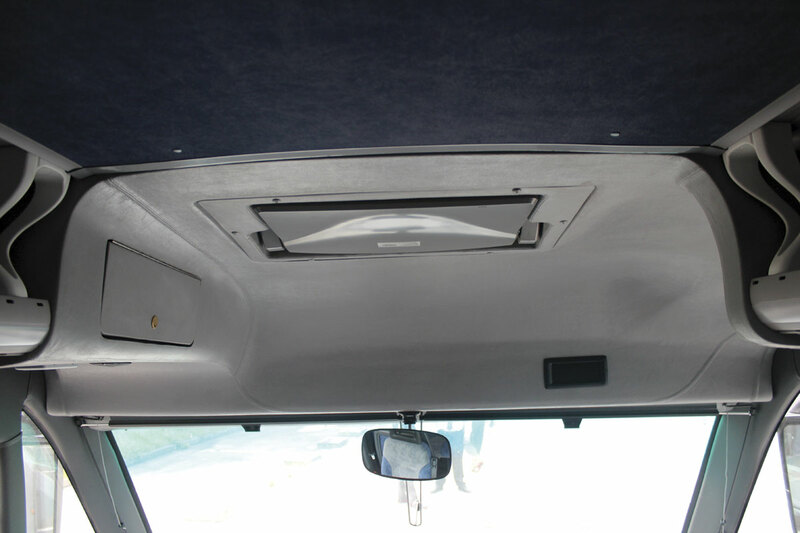 Allan Vaulter explained that a number of changes from the specification demonstrated had already been identified, significant among which would be the use of a deeper screen that would provide an additional 19cm at the upper edge, improving the view out for passengers towards the rear of the coach in the process. Another significant difference would be a smooth bonnet, rather than the example shown with its styling indent, which I rather liked but operators felt would limit their opportunity to add the fleetnames in the way they would wish. 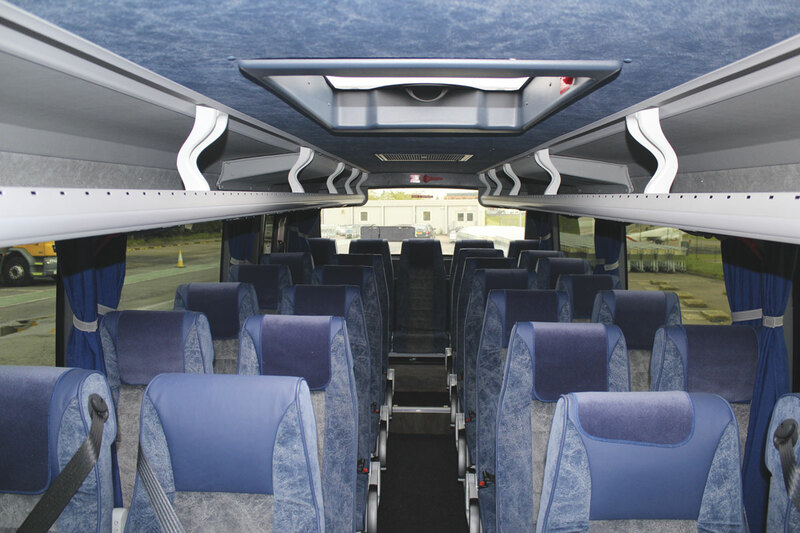 Lazzerini had supplied the 27 belted seats but, as on the existing Beluga, it was Allan’s intention that Vogel Eco40 units would be used on Voyagers for the UK. However, after the comments received suggested that operators could see nothing wrong with the Lazzerini units, he may well decide to retain them for the UK. Over the top of the cab area of the saloon, what at first looks as if it is grey leather trim similar to that used for the dash panel, turns out to be a leather effect plastic moulding when you touch it. This does not convey the feeling of quality that the rest of the coach creates and would not be used in the UK where real stitched leather would be substituted. 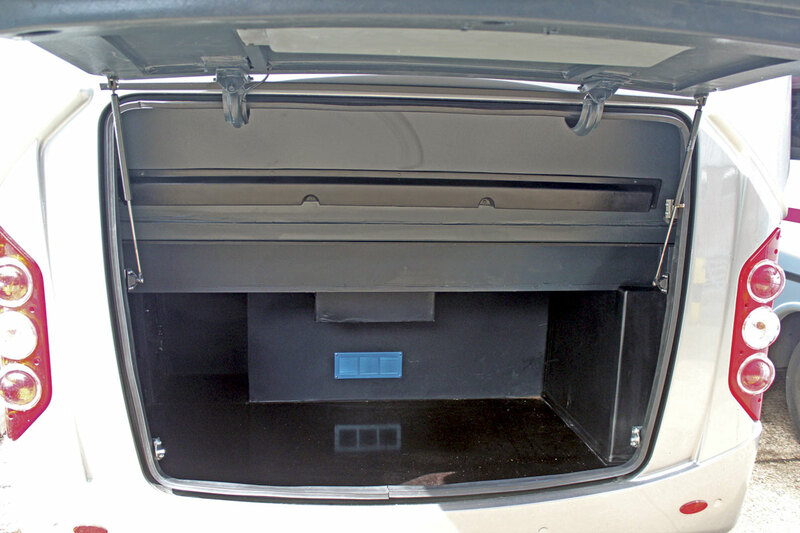 The audio system was by Pioneer but Moseley would fit Bosch as an alternative. 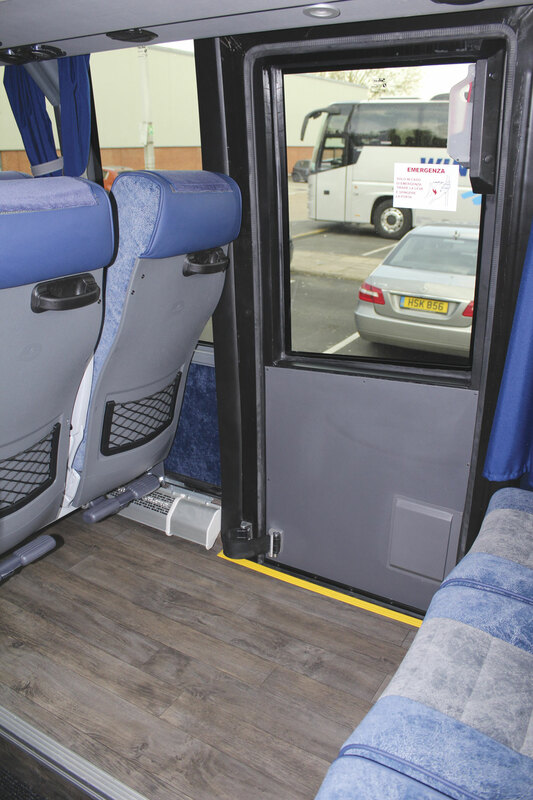 Other aspects of the finish included wood effect floor coverings, though the aisle and step areas featured a ribbed carpet, substantial attractive open racks with passenger service units, a marbled effect ceiling trim, a courier seat with rather more legroom than on the Beluga, a glazed roof hatch in the forward section and blue full draw curtains. 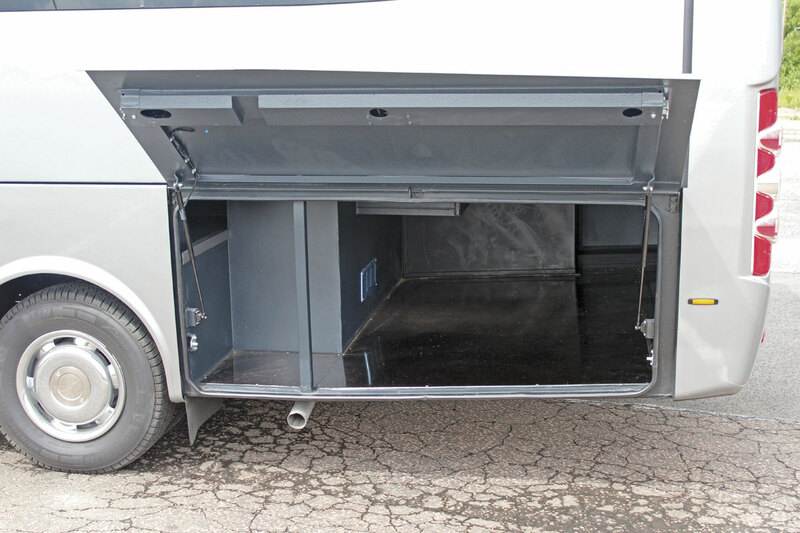 At the continental nearside rear there was a full height emergency door with drop down step arrangement, as now required by the regulations. It isn’t better than what went before but it does keep it legal. 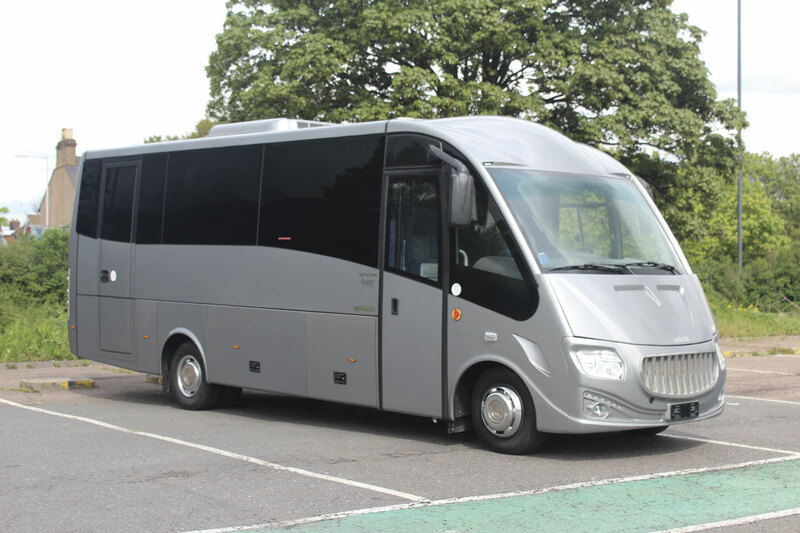 Cornishman, Dave Phillips, is the General Manager of London Mini Coaches, which has 12 vehicles in its current fleet, including the very last VDL Futura Classics ever built, a pair of 10.4m examples with only 35-seats. 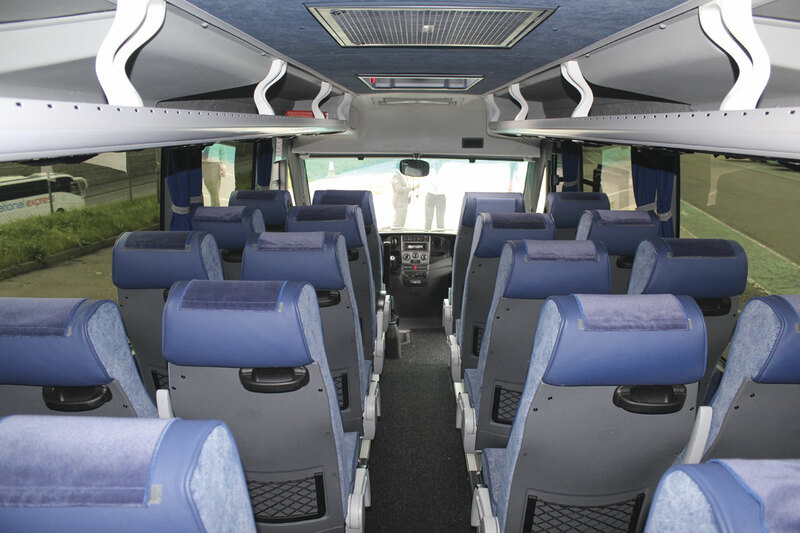 There are also two 16-seat EVM Sprinters but the bulk of the operation relies on eight Belugas. 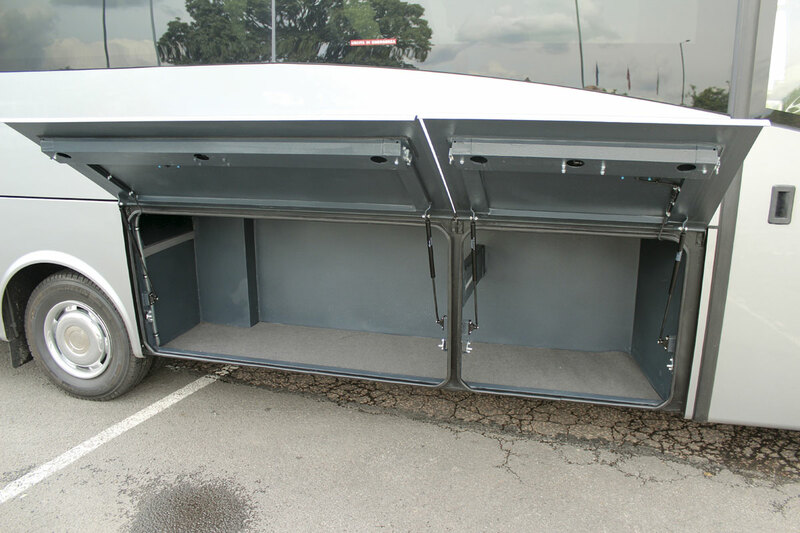 These have a specification that incorporates 25 reclining seats and a large rear luggage boot. 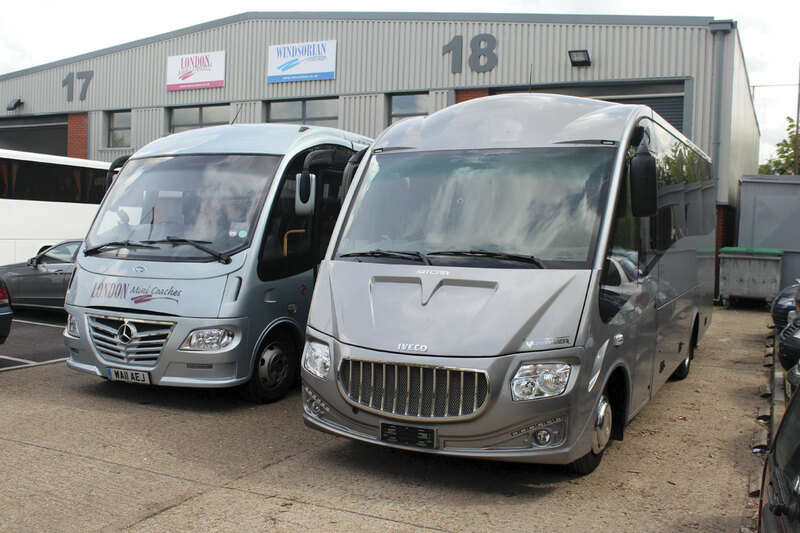 Over the years, London Mini Coaches has operated 20 Sitcars, (18 Belugas and two Atego based Marlins it kept six years) while the parent Anderson Travel fleet has operated a further six. Dave said of the Voyager, ‘The sides, the roof and the back are more stylish, except the marker lights at the front which need to be smoothed out a bit. 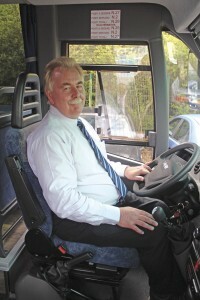 Looking round the coach, one of LMC’s driving staff was less positive about the frontal appearance. The same man did like the way a number of buttons to the driver’s left were mounted diagonally on the panel as he believed it would make them easier to identify. 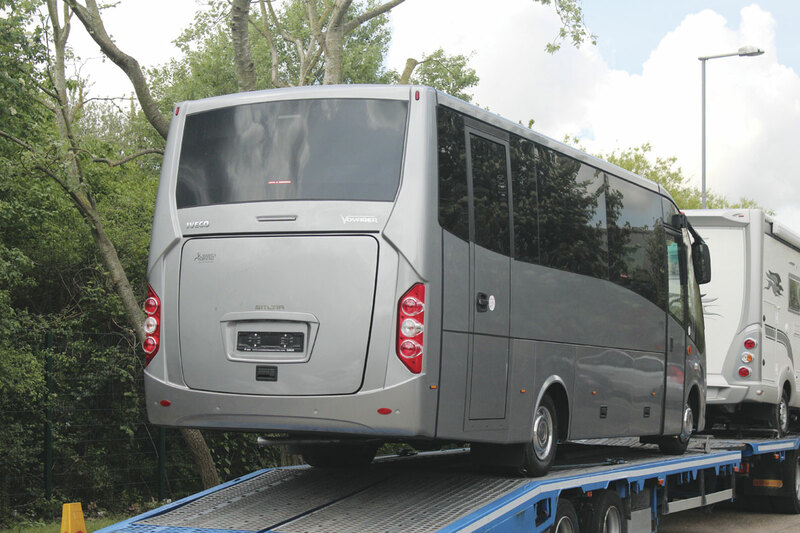 I wasn’t able to speak to other operators who inspected the vehicle over the course of its five day stay in the UK but Allan told me subsequently that, subject to a number of provisos, they thought the vehicle was suitable for the work they did. Several commented that they thought larger, heavier, alternatives being offered by their competitors were not suited to London operating conditions. Giving an opinion on the suitability of the Voyager was somewhat complicated by the fact that the base chassis it was mounted on was a Euro5 powered example with a four cylinder, three-litre engine, developing 170hp (125kW) at 2,990-3,500rpm and peak torque of 400Nm at 1,250-3,000rpm. It had a manual ZF 6S.400 six-speed overdrive transmission with Telma, rather than an automatic gearbox as Moseley in the South has become accustomed to supplying to London based customers on the Vario. 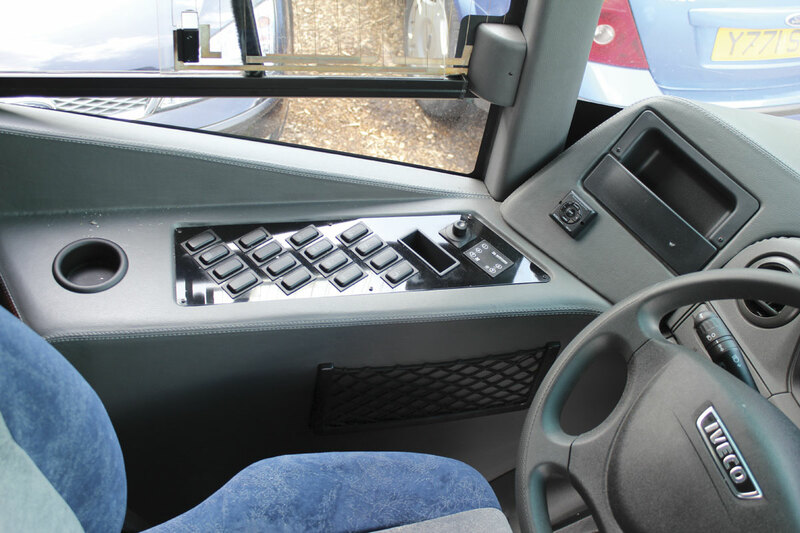 The Euro5 Daily is offered with the Agile ZF6AS400 automated manual option. 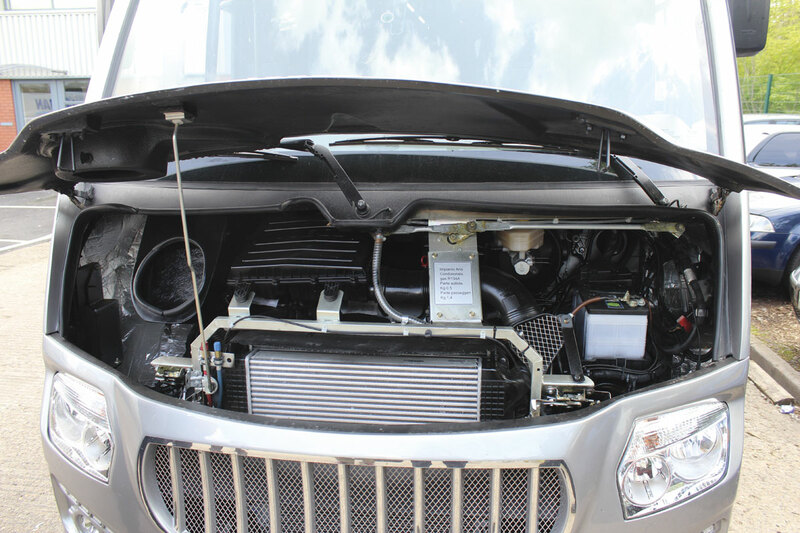 We don’t yet know what the transmission options for Euro6 will be. 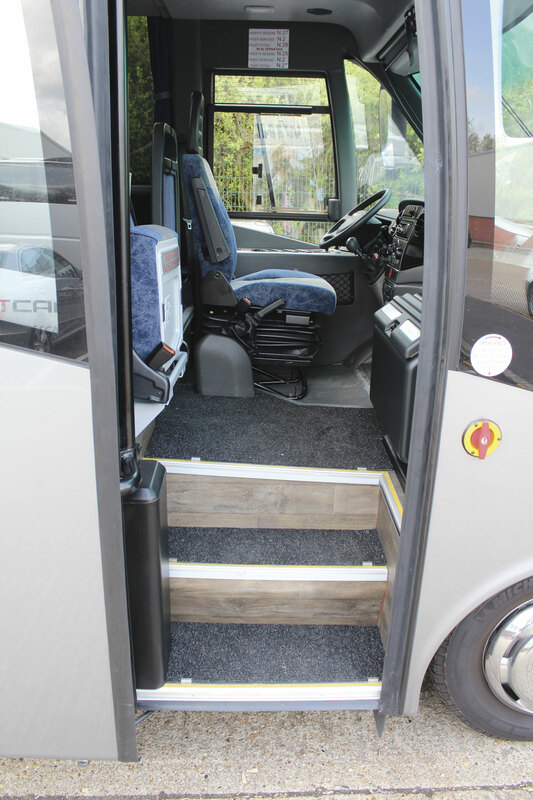 Other aspects of the Euro5 specification include the rear air suspension option, servo-assisted hydraulic brakes, the retarder option, ABS, EBD, ASR and ESP (electronic stability programme) as well as a hill hold facility. 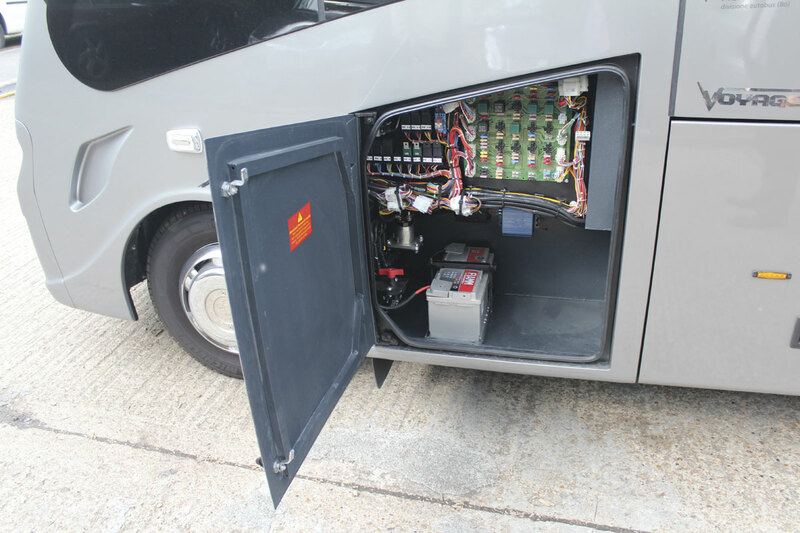 It has a 180A alternator rather than the standard 140A unit and 12volt 110Ah batteries. The wheelbase is 4,350mm. The Euro6 Daily is to be unveiled during June and Iveco is promising a 5% fuel saving compared with the existing model, as well as, ‘a significant improvement in Total Cost of Ownership for the vehicle, together with best in class performance and a wide choice of engines, transmissions and axle ratios.’ It will retain the ladder frame chassis layout. 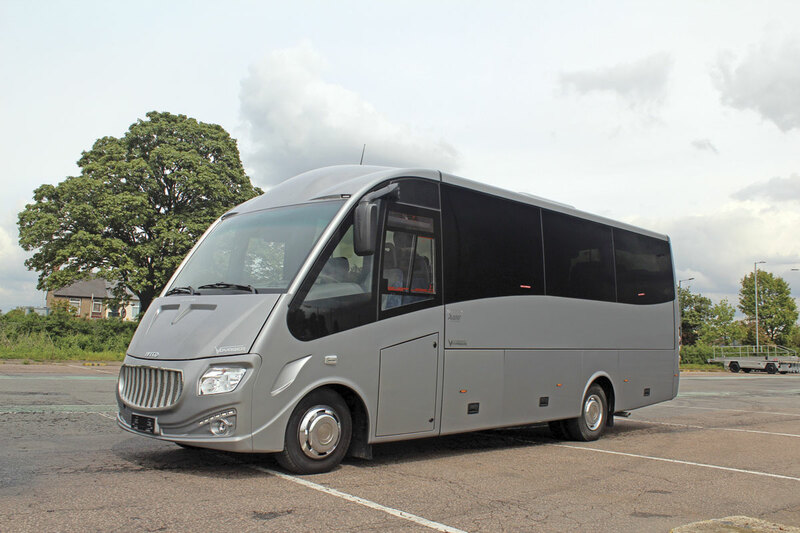 If you simply must have a Beluga based Vario and nothing else will do, at the time of going to press I understand that Jim Tweedie at Moseley Distributors in Scotland still has one 28 seater. This really is the last one available. The demise of the Vario, which has dominated this section of the market for so long, was always going to create a hiatus in the minibus market. There are alternatives, as the Voyager shows, as well as options on heavier truck chassis, but they all involve compromise. 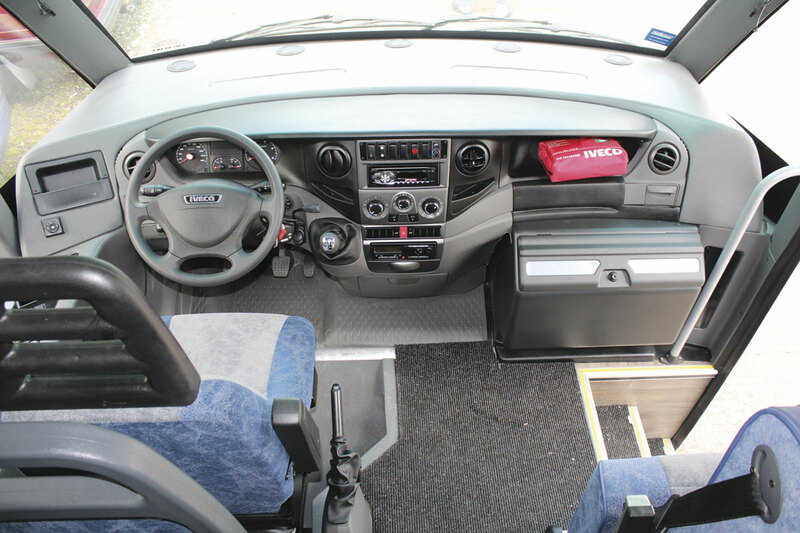 If you want to stay with Mercedes-Benz you are caught between the largest Sprinters and the smallest Ategos, but if only a true 25-27 coachbuilt minicoach will do, the Iveco Daily based Voyager is a good option. 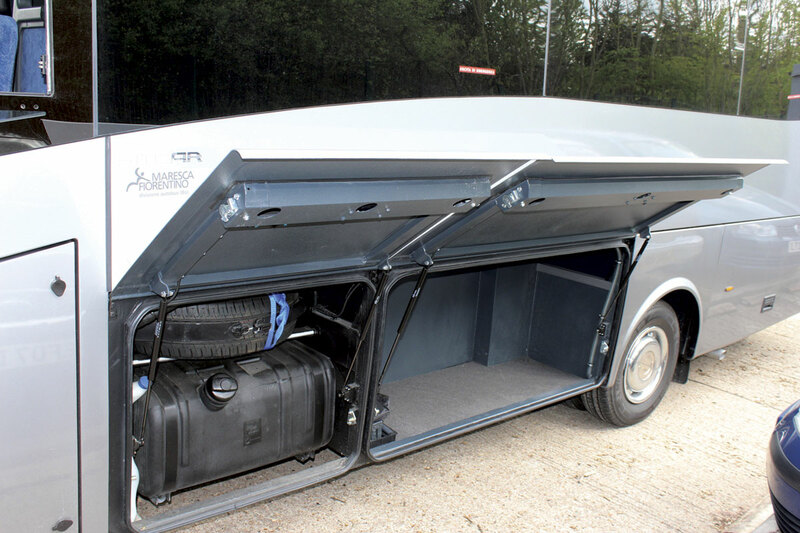 The body, by the time Moseley in the South have finalised a UK specification, would offer at least the same level of comfort as the existing Beluga 3 and would enjoy a significant price advantage of at least £10,000, despite complying with Euro6. It isn’t a Mercedes, but it drives and rides better than a Vario and is much quieter doing it. Is it what you are looking for? – only you can decide. My guess is that there is a place for it, but that it will probably sell in slightly reduced numbers compared with the Beluga because the strong three-pointed star following in this sector will lead some to move up to a higher capacity Atego based product instead, despite the cost difference and generally more complicated step arrangement. Whichever path you choose, the associated Moseley group of companies will be willing to assist as they have just agreed to take on the Indcar franchise in respect of Atego based products not offered by Sitcar. We’ll bring you more information when we have it.